Jared Kushner addressed reporters after his meeting with Senate investigators. 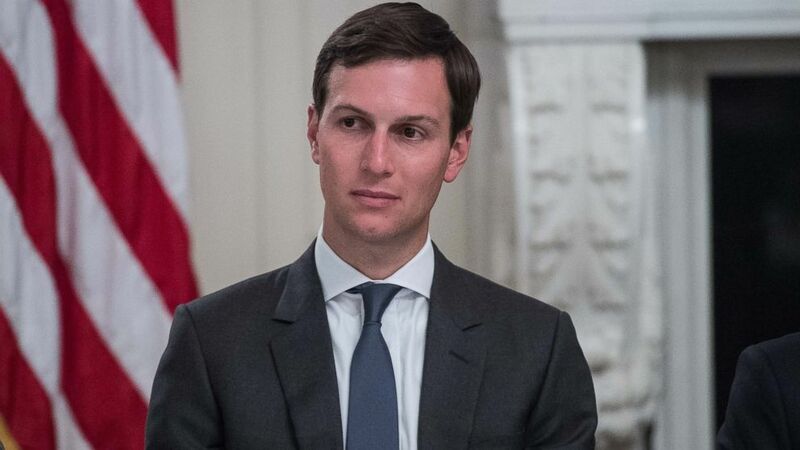 Jared Kushner, President Donald Trump's son-in-law and a senior White House adviser, publicly denied that he colluded with Russia during and after the election season. After a closed-door meeting with the Senate Intelligence Committee, he addressed reporters this afternoon at the White House, largely reiterating the written testimony he provided earlier today. "Let me be very clear: I did not collude with Russia, nor do I know of anyone else in the campaign who did so. I had no improper contacts. I have not relied on Russian funds for my businesses. And I have been fully transparent in providing all requested information," Kushner said. He went on, "Donald Trump had a better message and ran a smarter campaign, and that is why he won. Suggesting otherwise ridicules those who voted for him." Portions of his 11-page congressional statement, which was released this morning, detailed his four meetings with Russians during the presidential campaign and transition period. "I have not relied on Russian funds to finance my business activities in the private sector. I have tried to be fully transparent with regard to the filing of my SF-86 [security clearance] form, above and beyond what is required. Hopefully, this puts these matters to rest," the statement read. 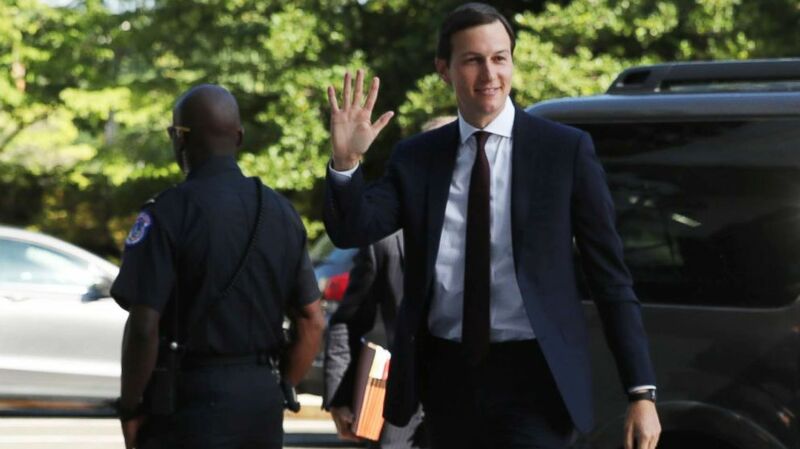 Accompanied by his attorney Abbe Lowell, Kushner arrived on Capitol Hill this morning for the committee meeting, flashing a smile and giving a quick wave but not answering questions from reporters. The meeting was conducted in an SCIF, or sensitive compartmented information facility, and lasted more than two hours. As Kushner was walking out of the committee meeting, a protester tried to force a Russian flag into his hand, asking himto sign it. The demonstrator was pushed back by security. The panel, which is one of several congressional committees investigating Russian efforts to influence the 2016 presidential election, has interviewed dozens of individuals as part of its probe. Kushner is one of Trump's closest confidants, an adviser who has been at his side since the beginning of the campaign. Kushner is the first member of Trump's family to appear before Congress as part of a Russia probe. His contacts with Russians are a focus of congressional investigators and for special counsel Robert Mueller, who is leading a separate probe into Russian election interference. (Nicholas Kamm/AFP/Getty Images) Jared Kushner, son-in-law and senior adviser of President Donald Trump, listens to a speaker during an American Technology Council roundtable at the White House, on June 19, 2017, in Washington. Kushner was one of several Trump associates to meet with a Russian attorney linked to the Kremlin in Trump Tower in New York in June 2016. Donald Trump Jr., the president's eldest son, organized the meeting with Russia lawyer Natalia Veselnitskaya after receiving a message from a business associate who said the attorney promised to share incriminating information about Hillary Clinton, according to an email exchange he released. He invited Kushner and Paul Manafort, the then-campaign chairman, to the meeting. Though Donald Trump Jr. has said nothing came of the controversial meeting, lawmakers hope to interview all the participants as they continue to investigate whether Trump's campaign worked with Russia during the presidential election. "The committee's going to reach out to everybody we feel has some contribution to make," Sen. Richard Burr, R-N.C., the chairman of the Senate Intelligence Committee, told reporters last week. Kushner, in his statement, said he did not know who would be attending the meeting and described it as a "waste of our time." He arrived to the meeting late, as participants were discussing Russian adoptions. He also said he asked his assistant to call him 10 minutes into the meeting to give him an excuse to leave early. "No part of the meeting I attended included anything about the campaign, there was no follow up to the meeting that I am aware of, I do not recall how many people were there (or their names), and I have no knowledge of any documents being offered or accepted," he wrote in his statement. Manafort and Trump Jr. are in discussions with the Senate Judiciary Committee about sitting for closed-door interviews. Both men have expressed a willingness to cooperate with congressional investigators. ABC News first reported Kushner's interview with Senate investigators last week. Kushner, who has been cooperating with investigators, is expected to appear before the House Intelligence Committee on Tuesday. "There is a lot we want to know," Rep. Adam Schiff, D-Calif., the top Democrat on the House Intelligence Committee, said on CBS News' "Face the Nation" on Sunday. "His counsel has said they will make him available for two hours, so we expect this is just going to be the first interview." (Andrew Harnik/AP) White House senior adviser Jared Kushner waves as he arrives on Capitol Hill in Washington., July 24, 2017, to meet behind closed doors before the Senate Intelligence Committee. Kushner is also expected to face questions about a meeting he had after the election last fall with Sergey Gorkov, the head of Russian bank Vnesheconombank, which has been sanctioned by the U.S. government. The White House and the bank initially provided conflicting explanations for the meeting. Kushner, in his statement, said the meeting lasted less than half an hour, and that he "expressed the same sentiments I had with other foreign officials I met." "There were no specific policies discussed," he said. "We had no discussion about the sanctions imposed by the Obama administration. At no time was there any discussion about my companies, business transactions, real estate projects, loans, banking arrangements or any private business of any kind." Kushner served as Trump's liaison to foreign governments during the transition. In December, Kushner met with the Russian ambassador to the U.S., Sergey Kislyak, at Trump Tower and discussed establishing a possible secret back channel for diplomatic communications between Russian and the United States. Kushner denied discussing "an on-going secret form of communication" or "a 'secret back channel'" with Kislyak in his statement Monday. "During the meeting, after pleasantries were exchanged, as I had done in many of the meetings I had and would have with foreign officials, I stated our desire for a fresh start in relations," he said. After Kislyak asked if he could convey information regarding Syria to Kushner and now-former Trump national security adviser Michael Flynn, Kushner "asked if they had an existing communications channel at his embassy we could use where they would be comfortable transmitting the information they wanted to relay to Gen. Flynn," according to his statement. "The ambassador said that would not be possible, and so we all agreed that we would receive this information after the inauguration. Nothing else occurred," Kushner said.